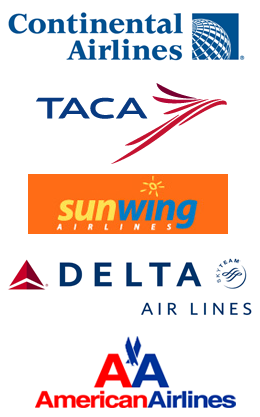 Commercial flights with Delta, American, Continental and Taca Airlines to La Ceiba, Honduras are available from most North American cities. Sunwing offers charter flights from Toronto and Montreal. For more information, times and pricing check with the carriers directly, your preferred travel agent or let us assist you with your travel arrangements to visit Trujillo. Fort Rouge Travel has been our valuable Canadian partner for many years and will be able to help you with your travel needs. We’ll meet you at the airport! Email Cathy Bernier with your flight information and relax. Be forewarned, Cathy’s been known to show up at the airport with cool beverages to quench your thirst. Life Vision Properties has a special welcome for all new property owners. Come to Honduras for a visit and we’ll give you the first two nights free at the beach front Campamento Beach Resort. It’s the perfect place to sample the laid back lifestyle that awaits you in Trujillo. Contact us for more information or contact Campamento directly to make your reservations.